Description: Miss Phoebe Finn was born and raised in the house at the end of the tracks. She lived a quiet, isolated life for years until Micah appeared outside her door. With no possessions and no last name, Micah was the least of which to leave an impression on anyone. But God saw fit to touch the life of Miss Phoebe that day with an unexpected friend. 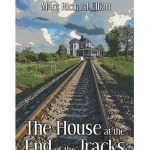 Review: The House at the End of the Tracks is a heart-warming tale of an elderly woman who sees Gods hand touch her life through the homeless man she finds outside her door. The story is full of God-inspired treasures that will allow you to see His true character of love and how He still works today even in those who feel their time of purpose has passed. I love the setting of the story and how it is told with Southern dialect. It gives the story even more character and warmth. God-centered lessons abound throughout, and one of the most profound messages I found in the book was that God has given everyone a purpose, if only we would acknowledge it. Positive: Micah has lived a hard life, losing loved ones, then losing his job and home. He learns to appreciate God for even the smallest things. Even in the worst of situations, Micah has a heart full of thankfulness. Spiritual Elements: The whole story is interlaced with Gods wisdom. Violence: Old man Booth lives up the road from Miss Phoebe. Rumor has it that he is so harsh that even his kids tried to throw him on the tracks. Other: Micahs sister, whom he is in search of, is dealing with drug addiction. One of Miss Phoebes sisters was killed in a drunk driving accident. Recommendation: The story is a message of hope and purpose even for those who are considered the least among us. I feel the book would be most appropriate for ages ten and up because it does deal with a couple of more mature situations with brief mentions of drug abuse and drunk driving.